XML decoder, sharing the spirit of Json.Decode. Ready for Elm 0.19. Using jinjor/elm-xml-parser as its parser component, which is based on elm/parser. Benchmark: Are they efficient? Are they fast? 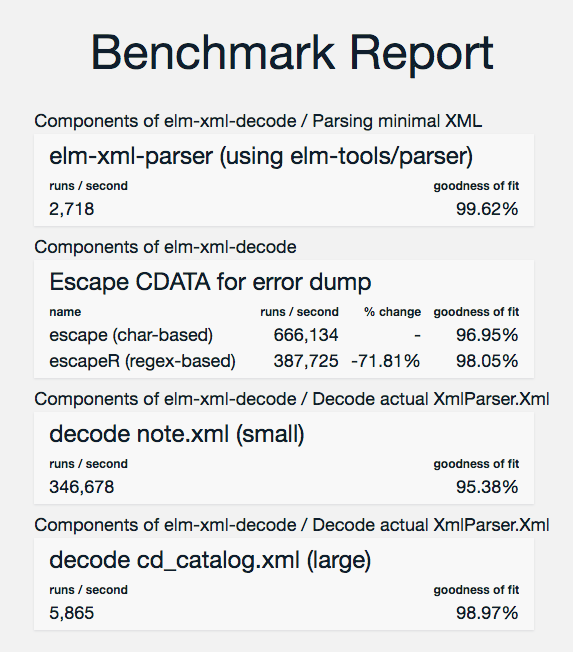 Benchmark codes can be found in benchmarks/ directory. Using examples in W3School. Looking forward to see similar benchmarks from other related works!! Using elm-explorations/benchmark. Available here as a static web page. It may hang for a while during JIT warming up, but keep waiting (~ a minute).